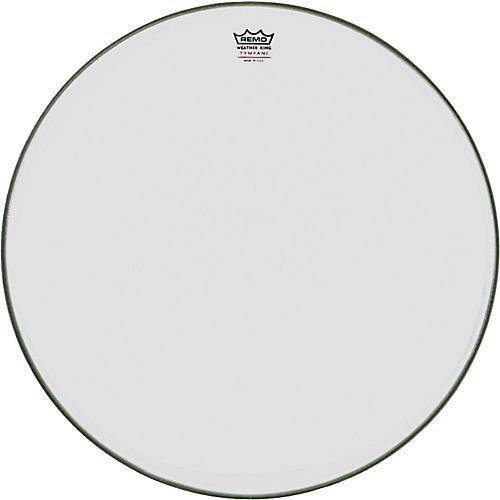 Open Box Remo Standard Hazy Timpani Drumheads 29 in. Pedal type timpani tuning mechanisms are spring loaded. The pedal will move to the toe down forward position - do not try to hold it back. Also, do not adjust the balancing spring tension. When replacing head, the opposite reaction will take place. It is recommended to use a small dab of Vaseline Petroleum Jelly on the threads of the key rods for lubrication. Be sure to clean the bearing edge of the bowl. It should be smooth to the touch. If possible, apply a very thin film of paraffin wax to the bearing edge before replacing heads.